Throughout human history, every great empire has had great builders and phenomenal architectural fits: The Romans with Emperor Titus who built the Colosseum, the Inca builders of Machu Picchu, the Egyptian pharaohs with the great Sphinx of Giza and the great pyramids, the first emperor of China and the Ming dynasty with the Great Wall of China. 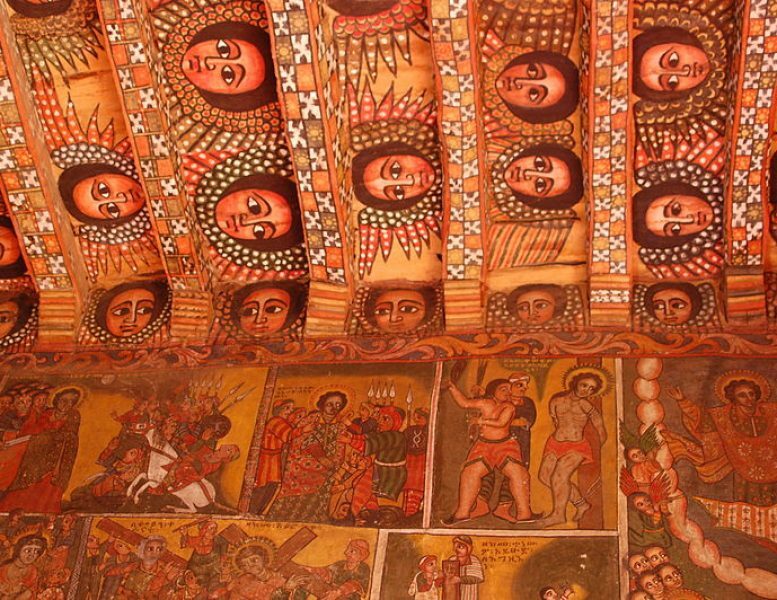 However, few today know of the Ethiopian builder Fasilides and his work. Ethiopian Emperor Fasilides is one of most remarkable rulers of Abyssinia, the ancient name of Ethiopia. A member of the Solomonic dynasty, emperor Fasilides ruled over Abyssinia from 1632 to 1667. 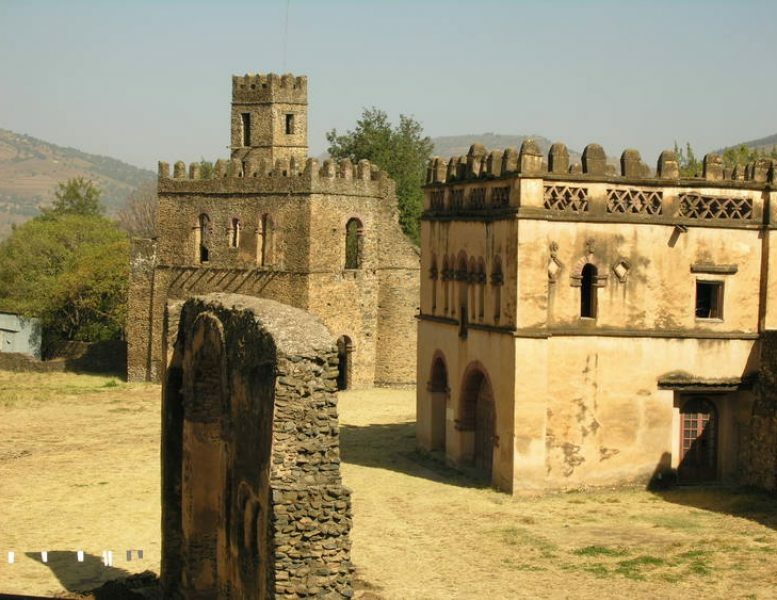 He founded the city of Gondar in 1636 which became the capital of Abyssinia, in the northwestern part of Ethiopia. He was known as Alam Sagad or ‘To whom the world bows.’ Today, thousands bow to his work, and his footprints have marked the history of Ethiopia forever. 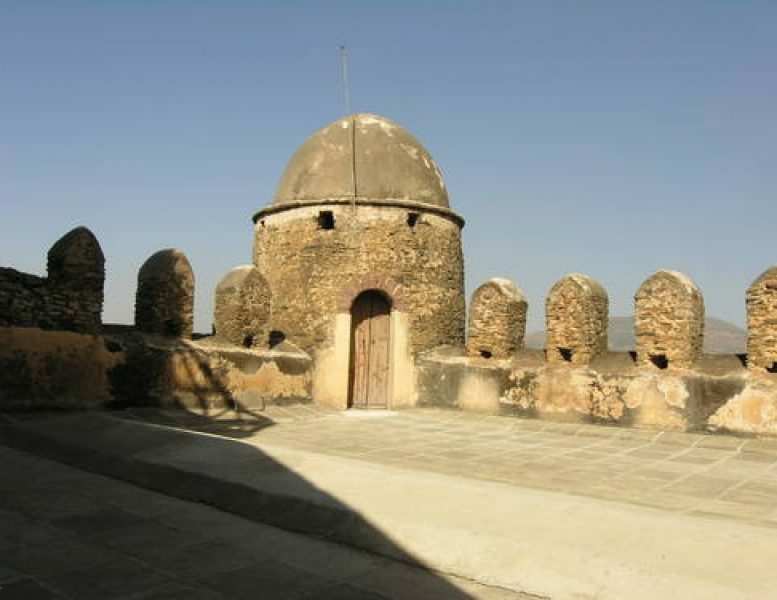 Surrounded by a nearly 900-metre-long wall with 12 entrances and three bridges, the city, which was put on the World Heritage List in 1979, has palaces, churches, monasteries and public and private buildings with Nubian, Hindu, Arab, and Portuguese influences; Fasil Ghebbi was a fortress-city in the 17th and 18th centuries. 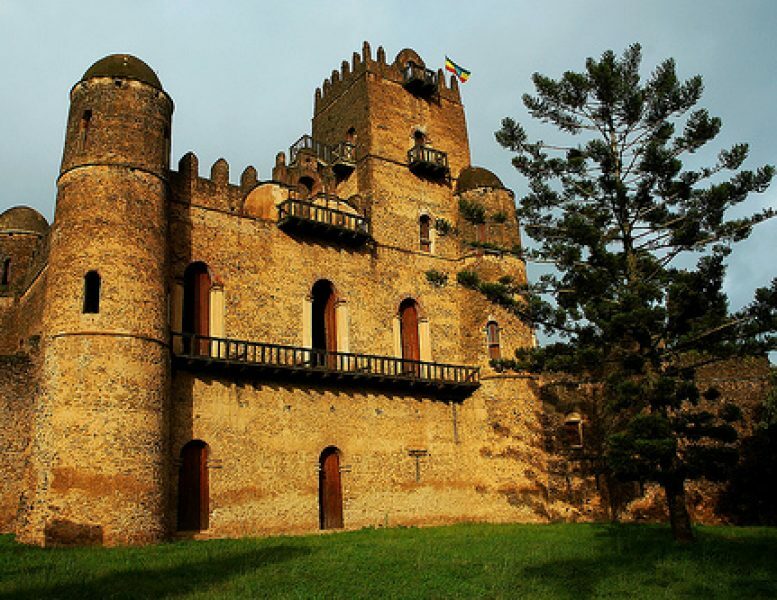 The Ethiopian emperor Fasilides lived there, and it remained the center of the Ethiopian government until 1864. 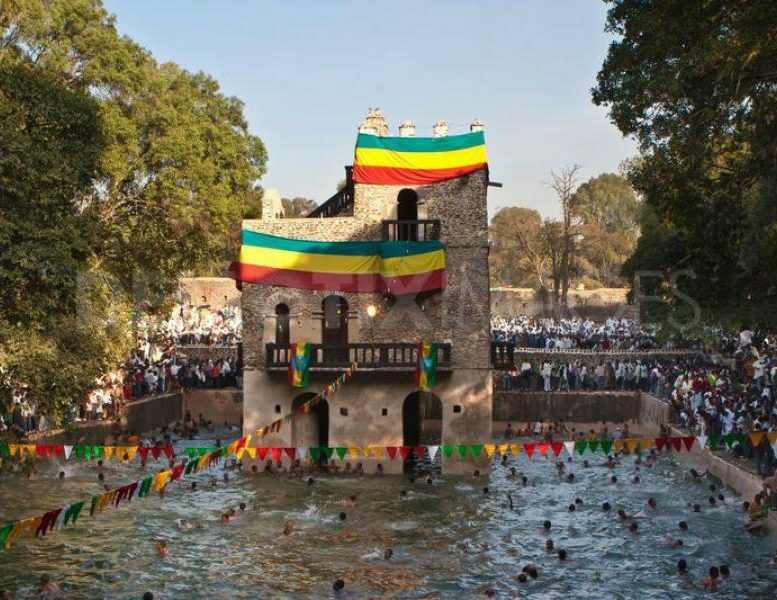 It is located at 747 kilometers from the capital Addis Ababa and 176 kilometers from the city of Bahir Dar. Being the center of the highest topography of the country in the Northern tip, it has a comfortable humid subtropical climate. 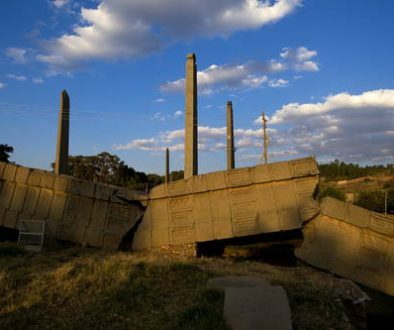 Part of the city was damaged by Fascist Italy during the five-year occupation of Ethiopia between 1936 to 1941. 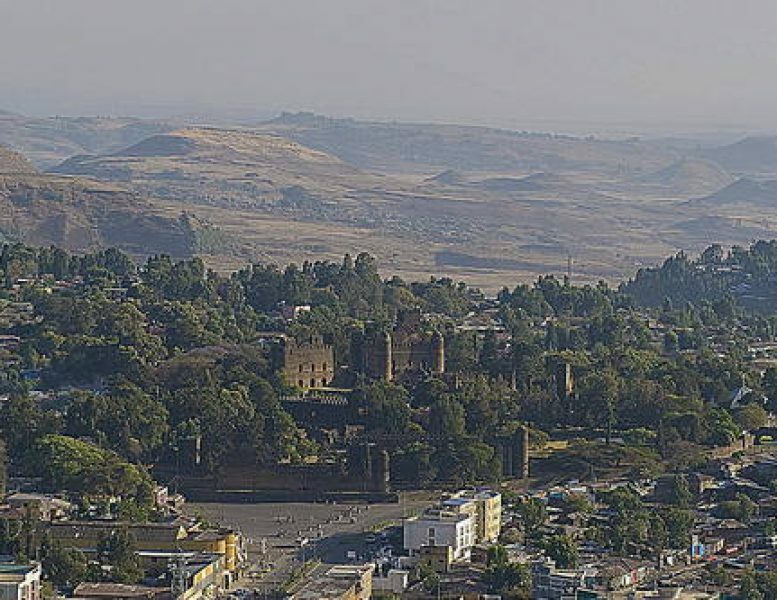 When King Fasilides made Gondar the seat of his empire in 1636, he constructed a palace that would eventually sprawl into a large complex, as successors added their own buildings to the compound. 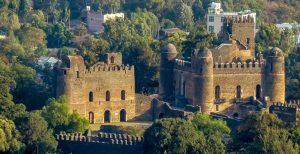 Set in the heart of what is now one of Ethiopia’s largest cities, the palace complex is a mixture of beautifully-preserved period architecture with European and Moorish influences, and rambling ruins. 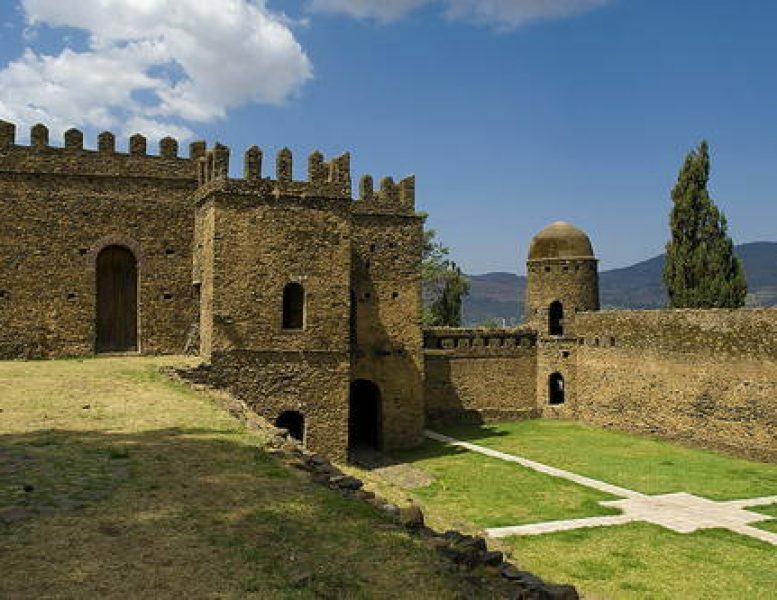 Interestingly, Fasilides’ Castle itself is the best-preserved, with its lower halls, reservoirs, and steam-baths remains of kitchens and stables, and even enclosures for leopards and lions that used to grace the grounds. The castle is located near the city center. Its structure is purely made of stone. 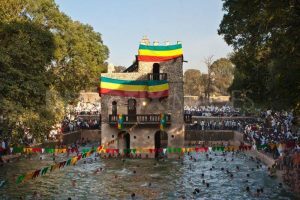 Today, Fasilides baths are used for baptism during the Timkat festival, the epiphany, in late January; they are only filled with water for the festival. 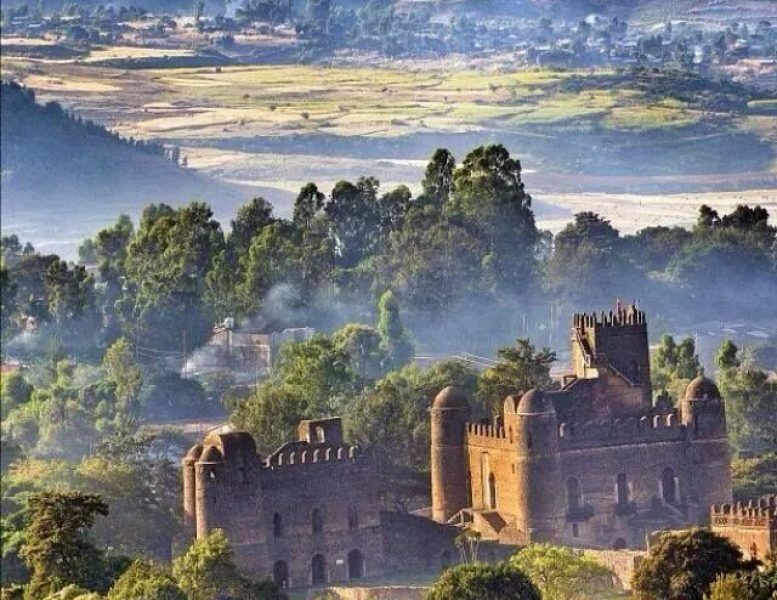 The castle can be found in Gondar, Amhara region. 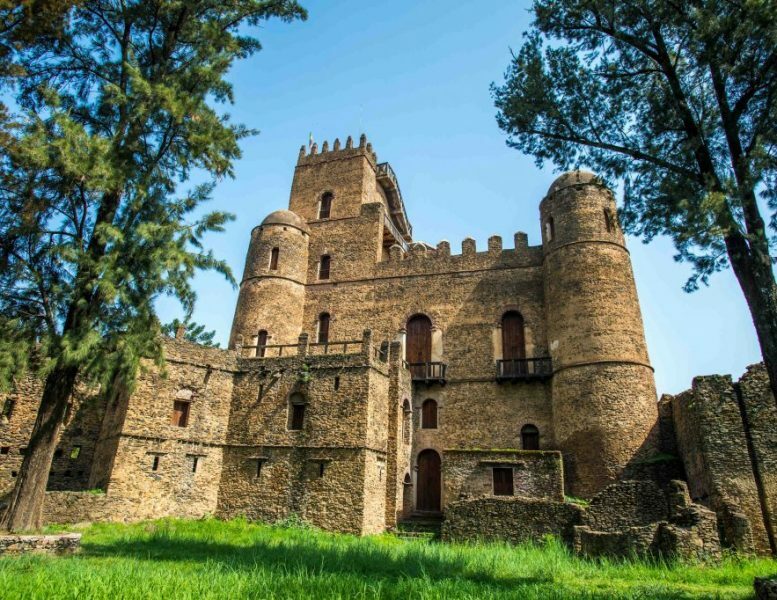 Fasilides’ Castle is definitely a representation of Ethiopia’s great and rich history. 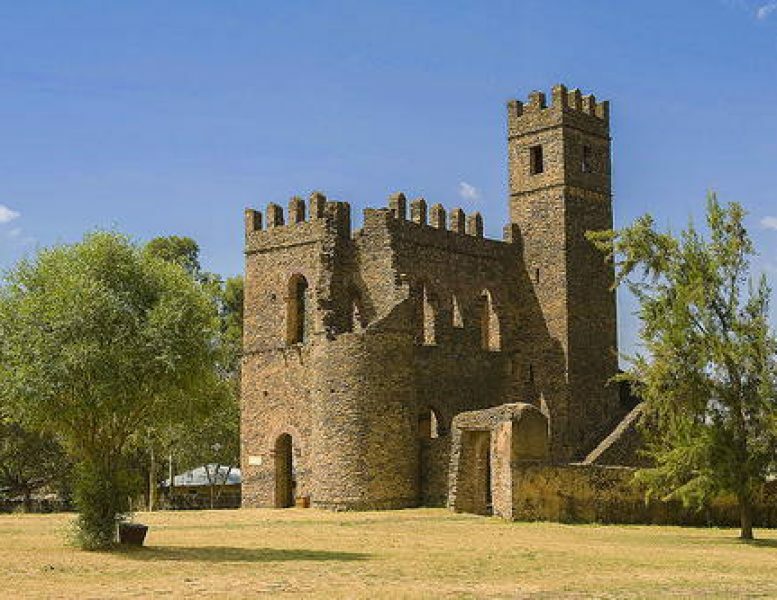 Among the buildings he constructed there are the beginnings of the complex later known as Fasil Ghebbi, as well as some of the earliest of Gondor’s famous 44 churches: Adababay Iyasus, Adababay Tekle Haymanot, Atatami Mikael, Gimjabet Maryam, Fit Mikael and Fit Abbo. 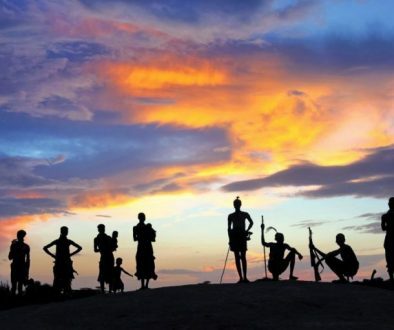 Fasilides is also credited with building seven stone bridges in Ethiopia. Sebara Dildiy (broken bridge in Amharic) was one of two stone bridges built over the Blue Nile River during Fasilides reign. 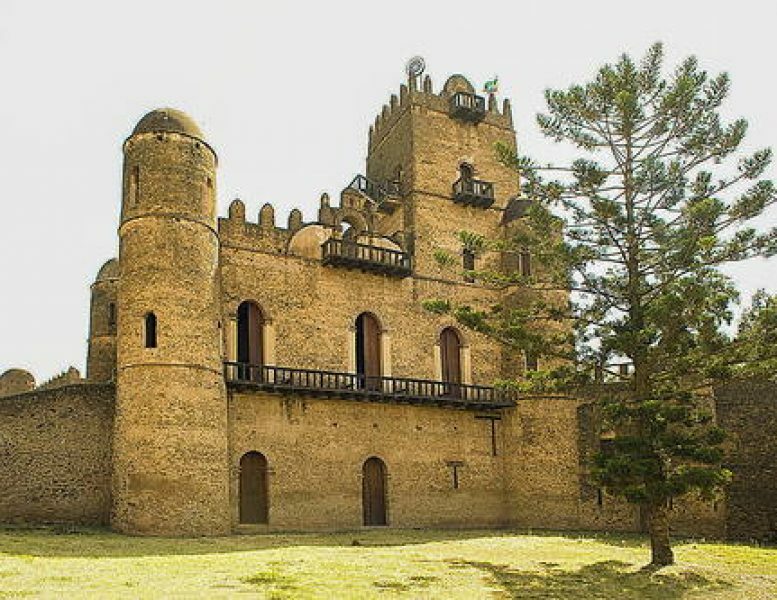 Sebara Dildiy was later repaired during Emperor Menelik II‘s reign in 1901. 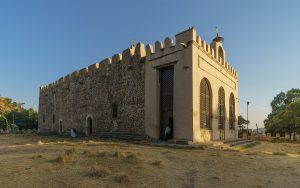 Emperor Fasilides also built the Cathedral Church of St Mary of Zion at Axum. 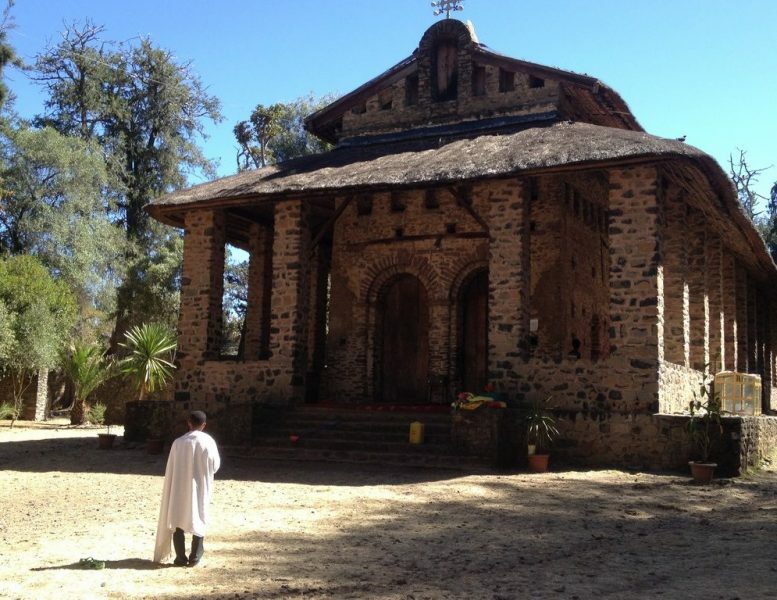 Fasilides’ church is known today as the “Old Cathedral” and stands next to a newer cathedral built by Emperor Haile Selassie. 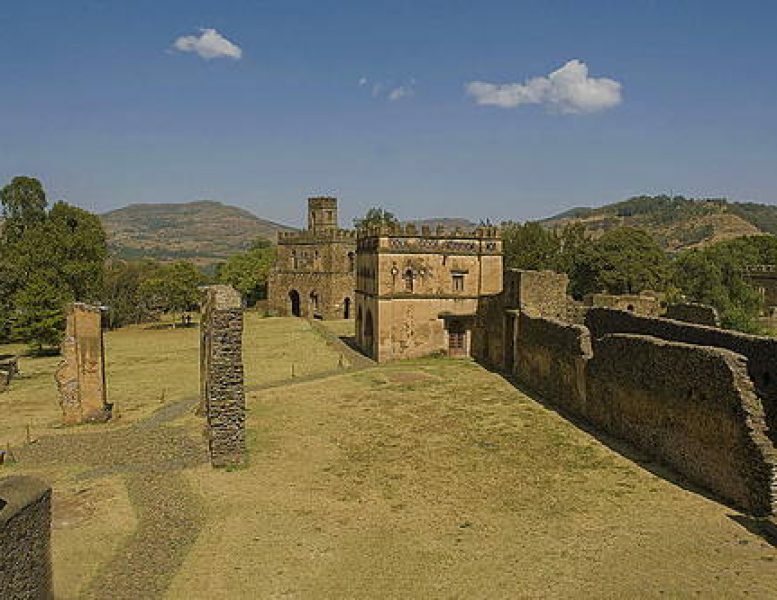 Between the thirteenth and seventeenth centuries, Ethiopian rulers moved their royal camps frequently. 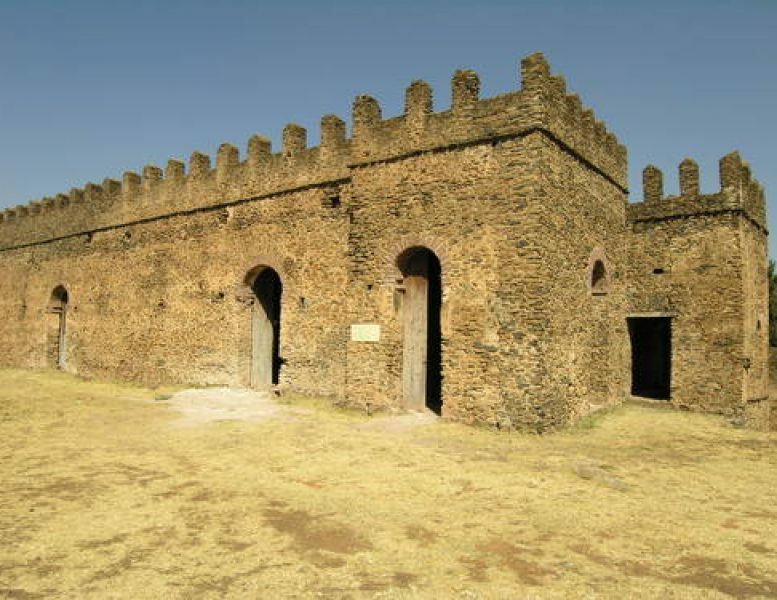 Emperor Fasilides broke with this tradition of progressing through the territories, and founded the city of Gondar as his capital; its relative permanence makes the city historically important. 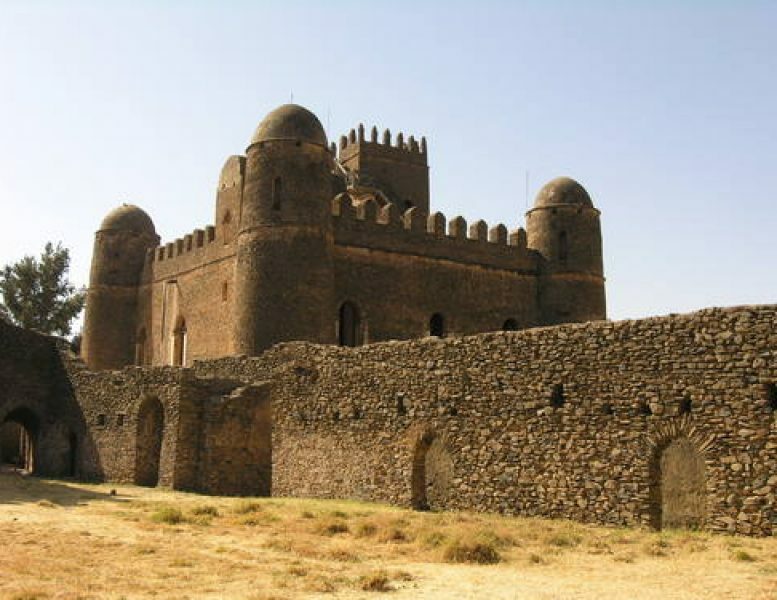 Within the capital, he commanded the construction of an imposing edifice, the Fasil Ghebbi or Fasilides castle. 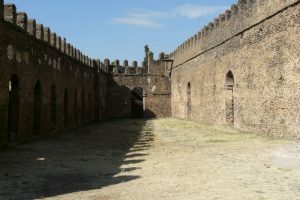 The area around the Fasil Ghebbi was delineated by a wall with numerous gates. 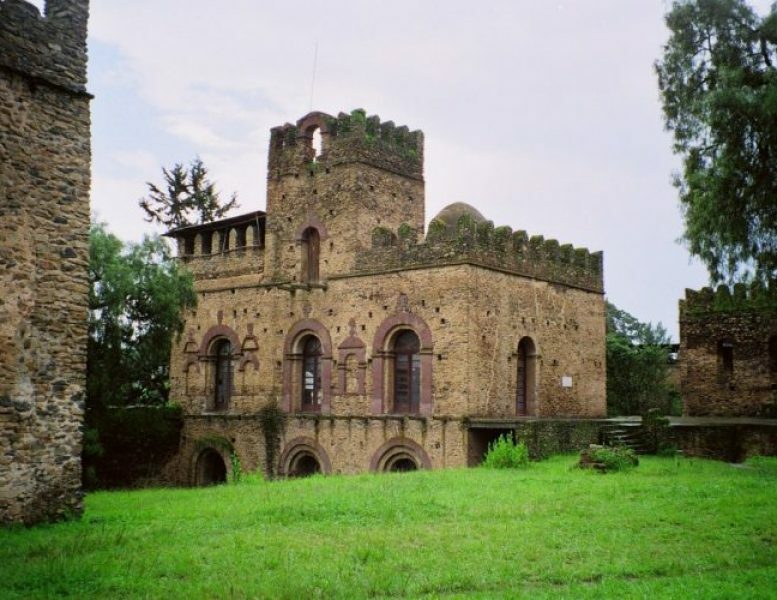 After Fasil, successive kings continued building, improving the techniques and architectural style, many of which survive either in whole or part today. Adlam Seghed Iyasu the Great (1682 – 1706), a grandson of Fasilidas, was particularly active. 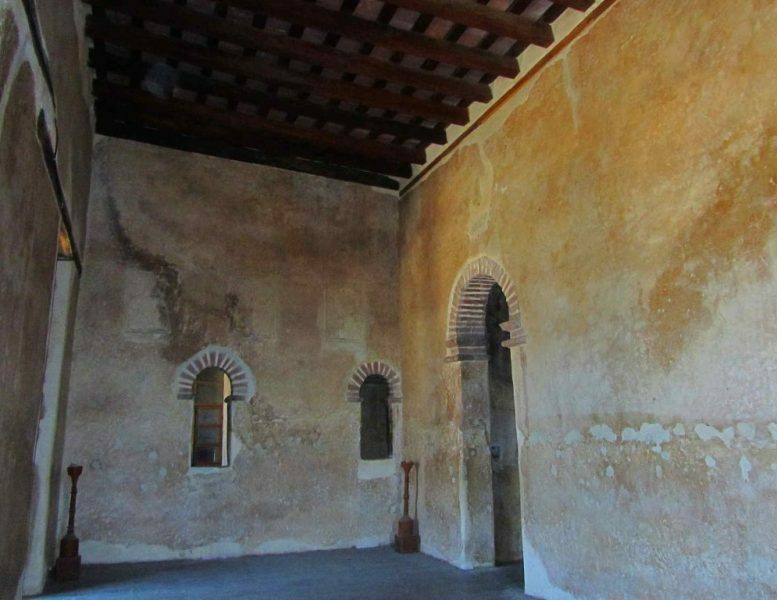 His castle, centrally located in the main compound, was described at the time as finer than the House of Solomon. 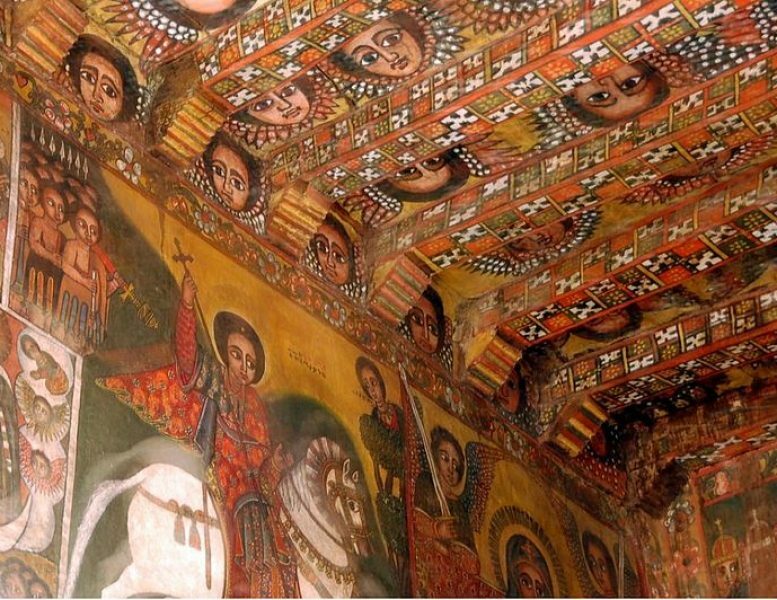 Its inner walls were decorated with ivory, mirrors, and paintings of palm trees, and its ceiling was covered with gold-leaf and precious stones. “Iyasu’s castle was the most decorated of the castles here. From far it looked like a horse’s saddle seat in shape. The arch roof was destroyed during the war with the Italians. 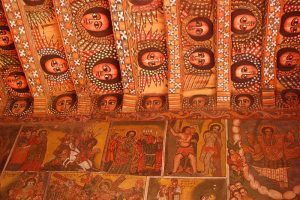 Inner walls decorated with ivory, mirrors, and paintings of palm trees, and its ceiling was covered with gold-leaf and precious stones. Subsequent emperors built their own structures, many of which survive either in whole or part today. 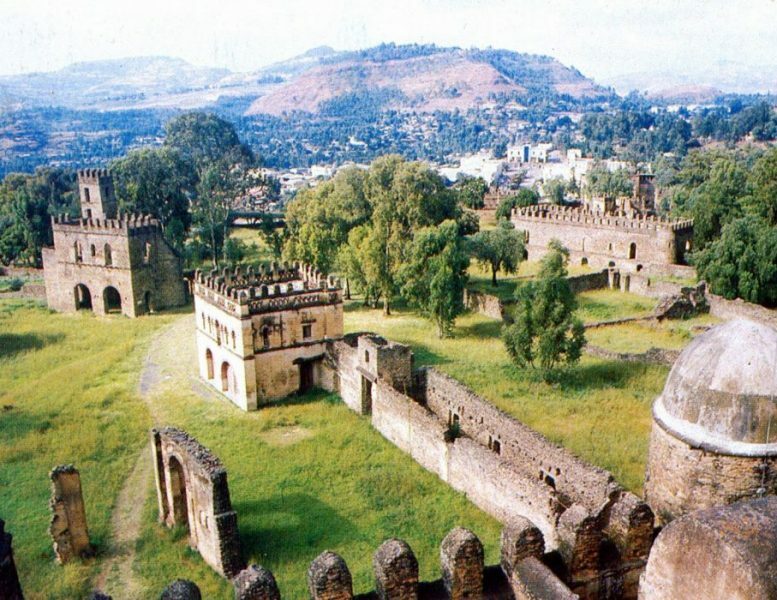 Before its decline in the late eighteenth century, the royal court had developed from a camp into a fortified compound called Fasil Ghebbi, consisting of six major building complexes and other ancillary buildings, surrounded by a wall 900 meters long, with twelve entrances and three bridges. It has some twenty palaces, royal buildings, highly decorated churches, monasteries, and unique public and private buildings. The main castle has huge towers and looming battlemented walls, resembling a piece of medieval European buildings. Beyond the confines of the city to the north-west by the Qaha River, there is a two-story pavilion of a bathing palace associated to Emperor Fasilides. 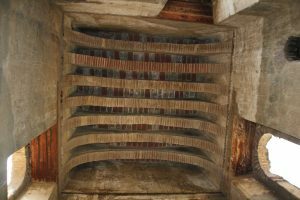 The building is a two-story battlemented structure situated within and on one side of a rectangular pool of water which was supplied by a canal from the nearby river. The bathing pavilion itself stands on pier arches and contains several rooms reached by a stone bridge, part of which could be raised for defense. Subsequent rulers, such as Iyasu the Great, continued building, improving the techniques and architectural style and expanded to the hills north-west of the city center, in the area known as Quisquam. 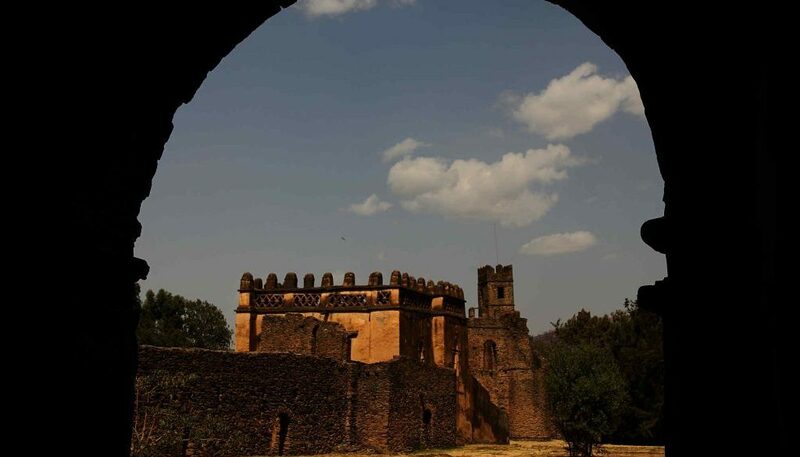 Fasil Ghebbi and the other remains in Gondar city demonstrate a remarkable interface between internal and external cultures, with cultural elements related to the Ethiopian Orthodox Church, Ethiopian Jews and Muslims. 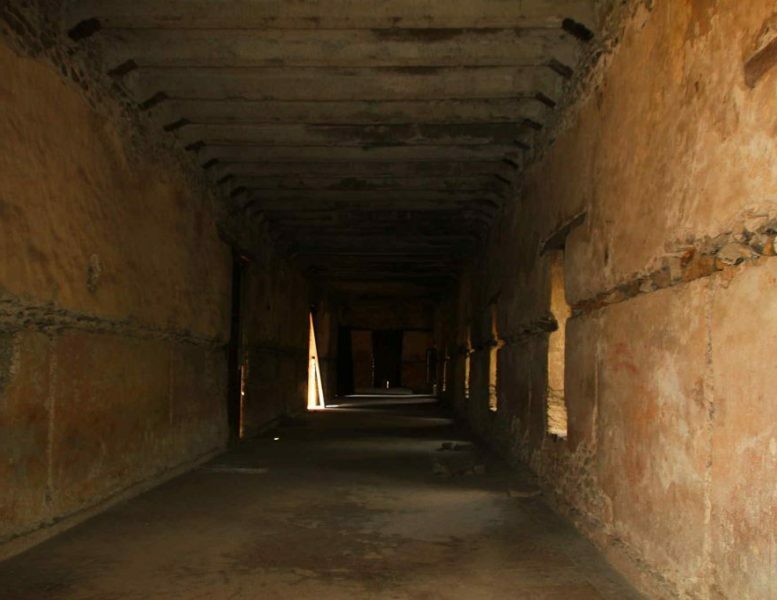 This relationship is expressed not only through the architecture of the sites but also through the handicrafts, painting, literature, and music that flourished in the seventeenth and eighteenth centuries. 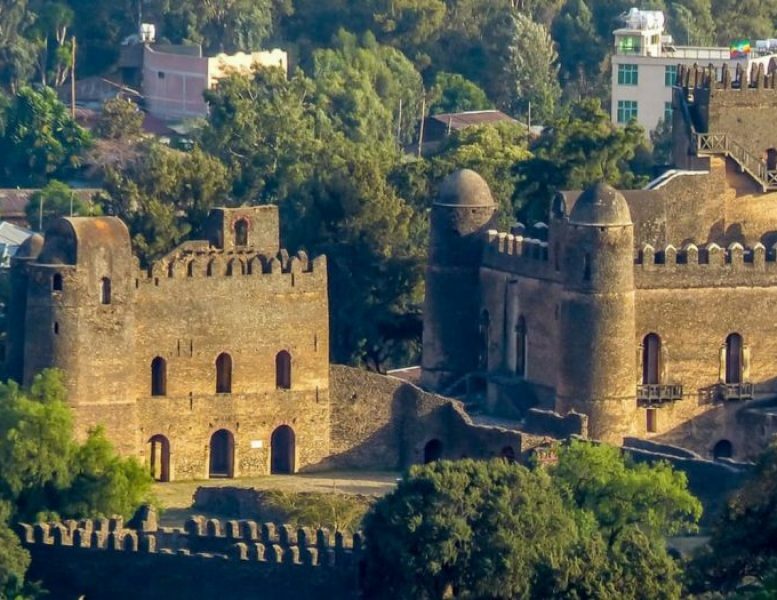 After its decline in the 19th century, the city of Gondar continued to be an important commercial and transport hub for northwest Ethiopia. Some of the monuments still retain their original spiritual function and the surrounding landscape has significant cultural importance for the local inhabitants. Gimjabet Mariyam Ber (Gate of the Treasury of Mary), which leads to the churchyard of Gimjabet Mariyam church. 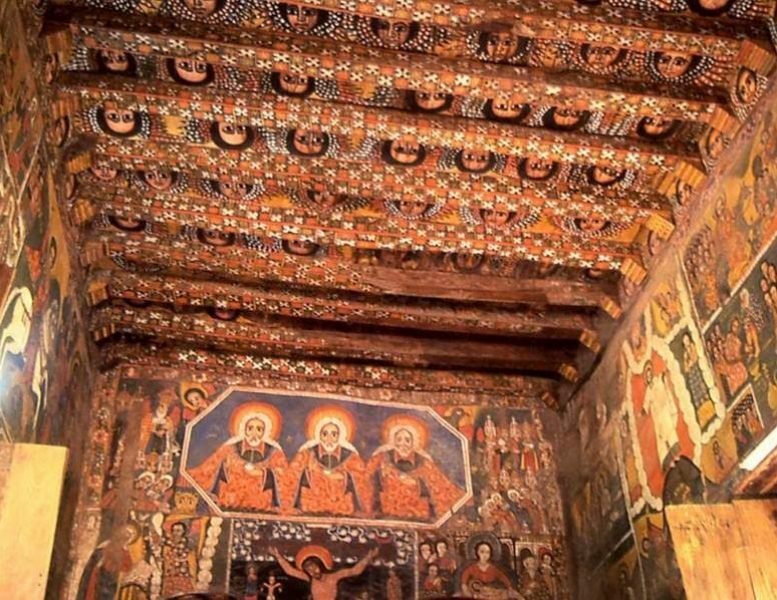 In addition to these, there is the Debre Berhan Selassie church, appealing as it is on the outside with its stone walls, arched doors, and two-tiered thatch roof, it’s the inner sanctuary of Debre Berhan Selassie, with its glorious frescos, that really shines. 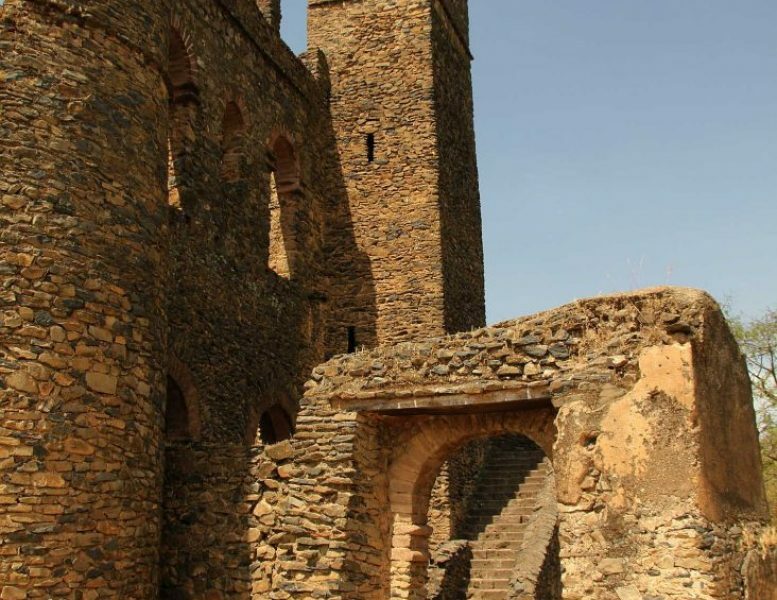 But it was very nearly destroyed like most of Gondar’s other churches. 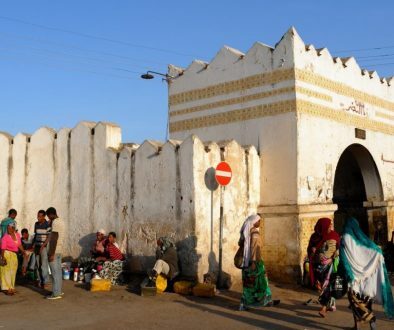 When the marauding Sudanese dervishes showed up outside the church gates in the 1880s, a giant swarm of bees surged out of the compound, chasing the invaders away. 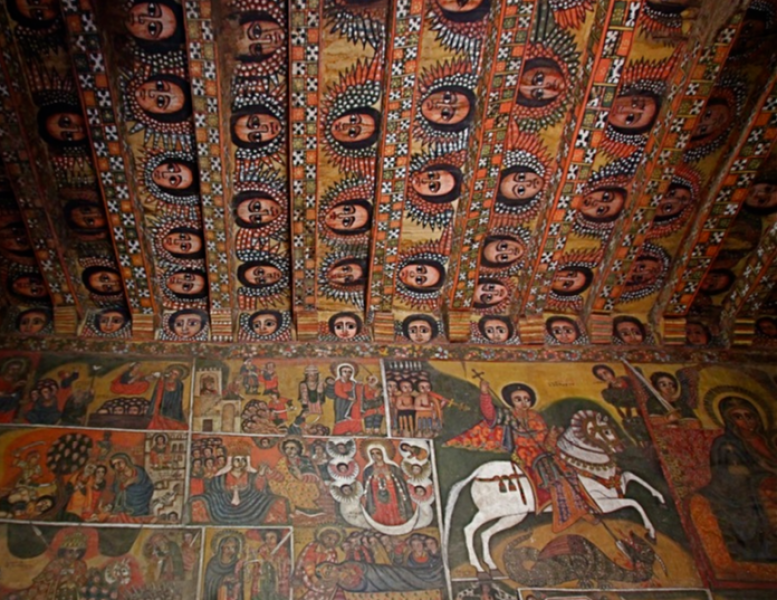 The ceiling, with its rows and rows of winged cherubs representing the omnipresence of God, draws most eyes. There’s space for 135 cherubs, though 13 have been erased by water damage. 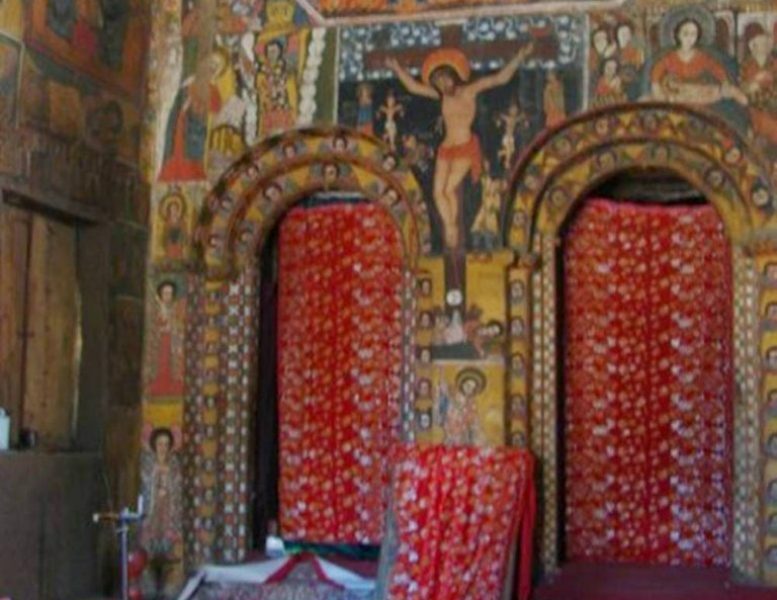 Inner sanctuary of Debre Berhan Selassie, with its glorious frescos, that really shines. Aside from the cherubs, the highlights have to be the devilish Bosch-like depiction of hell. 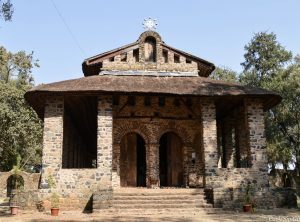 Although local tradition attributes most paintings to the 17th-century artist Haile Meskel, this is unlikely because the building only dates back to the late 18th century. The original circular church, created in the 1690s by Iyasu I, was destroyed by lightning. A large stone wall with 12 rounded towers surrounds the compound and these represent the 12 apostles. The larger 13th tower (entrance gate) symbolizes Christ and is shaped to resemble the Lion of Judah. If you have a keen eye, you’ll be able to spot the lion’s tail above the doorway in the wall west of the church.